Offer something different this year for your annual cookie exchange — you can be sure that no one will be disappointed with these incredible cookies. Preheat the oven to 350°F (175°C). Butter baking sheets or line them with parchment paper. In a large bowl, whisk together first 5 ingredients. Set aside. Combine the butter and sugars in a medium bowl; cream together until light and fluffy. Add honey, beat to combine. Add egg, beat to combine. Add chopped ginger; mix, and then spoon in dry ingredients and mix just to combine. Cover with wax paper and chill for 30 to 45 minutes. Place the Demerara in a shallow dish. Shape the dough into 1-inch balls, rolling between the palms of your hands to make them even. Roll dough balls in sugar, and place 3 inches apart on baking sheets. Bake until the tops are evenly browned and edges appear firm, about 10 minutes. Remove from the oven and let stand for 3 to 4 minutes. Transfer to cooling racks to cool completely. 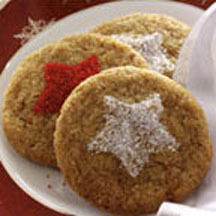 Decorate cooled cookies with sanding sugar is desired. Makes about 3 1/3 to 4 dozen.